A local retirement community in Lawrence, Westminster Village North, began making changes to its everyday operation this summer with an outside-the-box idea residents are responding well to. 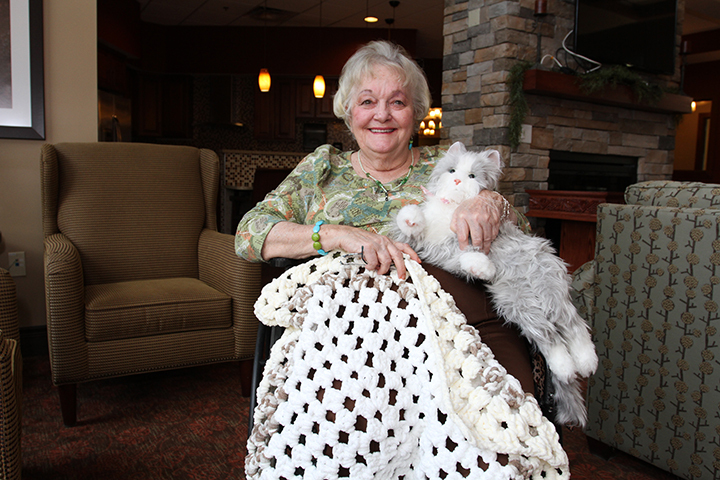 The introduction of robotic cats has taken the facilities – which include several elder-care options from independent to assisted living and rehabilitation and memory-care services – by storm. 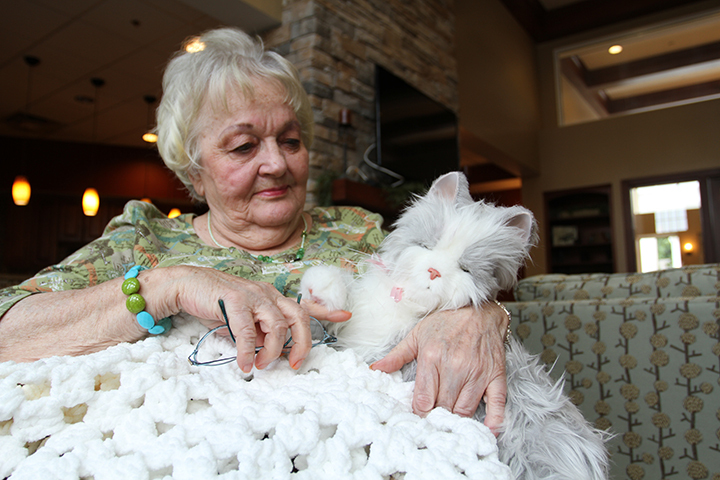 Earlier in the summer, two sisters, Ruth Iliff and Dot Ryan, both residents of Westminster Village North, introduced the robotic cat (Buttercup) they purchased to other residents by sharing it in one of the memory care areas. So in mid-July, the facility began purchasing the Joy For All Campanion Pets through Amazon. Resident Donna Williams is among the beneficiaries of the initiative. Nearly one month ago, she received her own companion cat, which she named Fancy, after a Persian cat she used to own. Williams, who used to own a miniature pinscher, had to give up the dog before moving in to Westminster Village North because some areas do not allow residents to own pets. The facility has nearly 20 companion pets for its 350 residents Westminster purchases the pets but also receives donations from residents’ families. Approximately half of the cats are “owned” by individual residents. The rest are shared. Each cat can raise and lick its paws, roll over, open and close its eyes, purr and vibrate, meow and more. Made by Hasbro, they run on batteries and are available in three colors. Cats cost $100. The dogs cost approximately $125. Roman said depending on their condition, some of the residents know the cats are robotic companion pets and some feel as if they’re real. Cat features: The size of a real animal, the companion cat reacts to touch, can raise and lick its paws, roll over, open and close its eyes, purr and vibrate, meow and more. Dog features: Modeled after a Labrador retriever, but not to scale, the companion dog reacts to touch, barks, moves its head and paws, wags its tail, has a simulated heartbeat and more.